Isn’t Smile You very interesting? Do you detest the spoilt Jung In (her character’s name)? In reality, I am actually very kind and well-mannered. Jung In will soon become like what I am in reality. Lee Min Jung is widely acknowledged as a rising star in 2009 thanks to her role in KBS2TV’s Boys Before Flowers earlier in the year. Since then, she has scored several CF deals and photoshoots. In September, Lee Min Jung became the lead actress for SBS’s weekend drama, Smile, You, playing a rich and spoiled girl who goes through change forced upon by her family going bankrupt. 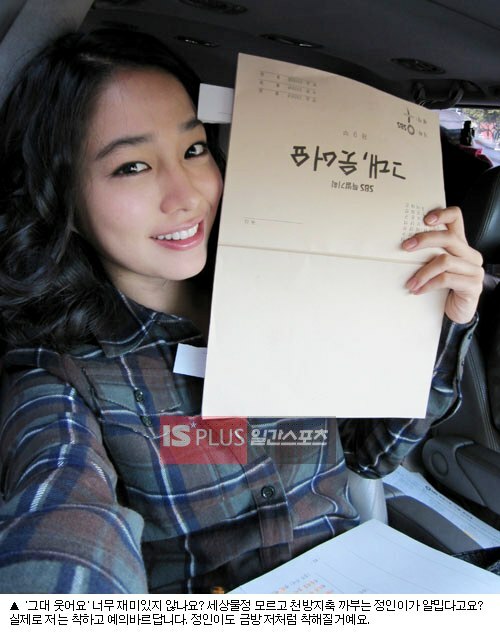 Let us now walk you though Lee Min Jung’s life as an actress through her selCas. Everyone rehearsing their lines before filming begins. SelCa with Lee Chun Hee oppa. I don’t see eye-to-eye with Song Ok Sook sunbaenim in the drama. Look at me glancing at her with rivalry etched all over my face. But once filming stops, Song Ok Sook sunbaenim gives me plenty of good advice. I have a love-hate relationship with Jung Kyung Ho in the drama. Although we squabble often, we both have affections for each other inside our hearts. Resting my head gently on Kyung Ho’s shoulder like what lovers do. But Kyung Ho seems to be feeling the burden. The strawberry milk is mine after the filming ends. Drinking during filming, drinking after filming. I think I drank a lot of strawberry milk on that day. But luckily, it’s my favourite. Filming usually lasts till dawn. It’s tiring staying up, and then you get attacked by chilly winds in the early morning. A cup of coffee becomes my energy source. Turning into a beautiful bride in a wedding gown. I am seen here looking at my cellphone. I think I got some important text message… but I can’t remember what it is about. Applying the final touches to my makeup. Thanks to my fair skin, the bride’s makeup is looking really fine. This is Lee Kyu Han oppa who dumps me at the altar. 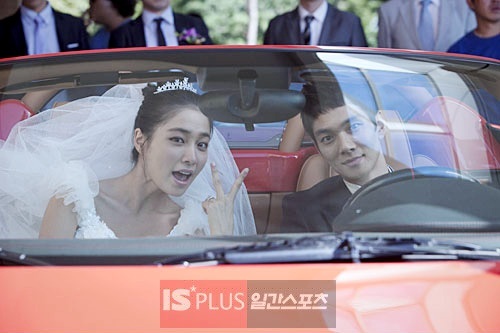 Although I might look happy with the V-sign, I will soon be dumped on the highway by him (sighs). Posing with an exaggerated expression. Sticking my tongue out before eating something is a habit that I am apparently unaware of. Who’s the pretty girl beside me, you might ask? It’s my stylist. You’re saying that she’s prettier than me? Looks like there will be no more photos of me with her again in future.